The days are a little shorter, Halloween candy is on the shelves at CVS, and some kids are already back in school. Indeed, autumn is around the corner. Happy Monday, folks! I hope everyone had a nice weekend! In last week's RECYCLE IT! series, I wrote about how you can recycle bottle caps right along with the bottle! In this series, I want to make all of our readers the most efficient recyclers they can be. There are a lot of items where the average person might be unsure whether or not it's recyclable. Sometimes it's confusing. We all know the basics - recycle your jars, cans, and newspapers. Put them in your recycling bin, drag it curbside, and your duty is done. Right? Well, not always. Today's "Fun Fact Friday" has a bit of a sadness to it, so I've changed it to "Fascinating Fact Friday" - just for today. As the world mourns the loss of Robin Williams, I began to think about the different roles he played over the years. My favorite was Mrs. Doubtfire, but another movie I enjoyed as a kid was FernGully: The Last Rainforest. It's hard to think about this while still in summer mode, but yes, it is that time of year...it's time to get ready to go back to school. How can you buy school supplies for your kids in the greenest way possible? 1) Avoid backpacks made of (PVC) vinyl. Vinyl contains dioxins, which the EPA says is a leading cancer-causing agent. Soft vinyl sometimes has di-2-ethylhexyl phthalate, which the U.S. National Toxicology Program has identified as a carcinogenic compound. Seek backpacks made of cotton, canvas, or even hemp or bamboo! Pick something sturdy and long-lasting, one that you won't need to replace annually. LL Bean backpack last forever! 2) Buy a reusable lunchbox or bag instead of having your kids use paper lunch bags. Again, avoid PVC. We like this Litter-Free Lunch Kit. Americans, on average, spend 25.5 minutes on their way to work according to the US Census Bureau. That's only one way. Which means most of us are spending nearly an hour a day traveling to and from work. 10.8 million Americans travel an hour each way. For 600,000 unfortunate souls, called mega-commuters, an average commute is at least 50 miles and 90 minutes one way. Spending that much time in the car each day isn't very green. Using all of that gas, running air conditioning, idling in traffic — none of it is good for you or the environment. How much can you make your commute greener? 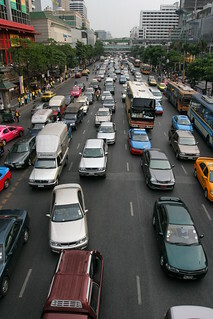 How often do you feel like you're stuck in gridlock traffic? This is the first in a weekly series entitled "Recycle It!" I was inspired by a little tiff I had with my husband about whether or not an item was recyclable. We are both obsessive about recycling but sometimes one (or both) of us is unclear about what is recyclable or the rules of recycling. Sometimes they're not obvious - even to avid recyclers like my husband and me! Other times, the rules change with more modern recycling technology. So, I bring you "Recycle It!" Every Monday we're going to start the week off with a tip to help you make the most of recycling! A few years ago, I used to write a weekly post profiling a Keen and Green celebrity every Friday. It was a fun series to do, but ultimately I ran out of celebrities to cover. I started to miss having a Friday series to close the week, so today I am starting "Fun Fact Friday." I'm going to dig up some trivia, interesting information, or a tidbit from history - all related to the environment! - to share with you every Friday. Enjoy! We all know how important it is to bring reusable bags to the grocery store, but even those of us with the greenest possible intentions forget them sometimes. - For women who carry purses, keep a few in your purse. Some (not all) scrunch up pretty well. ChicoBags are perfect for this. They fold up easily and they don't take up too much space. They also can hook up to a keychain!